Genetic Genealogy Ireland: Will DNA testing change the face of Irish genealogy? Will DNA testing change the face of Irish genealogy? Maurice Gleeson looks at the results of a recent DNA survey and offers a critical appraisal. A new survey on this website reveals that 93% of people would be interested in having a DNA test done to help find their ancestors. The survey is being carried out as part of the run-up to Ireland's first conference on genetic genealogy at the Back to Our Past exhibition at the RDS in Dublin from October 18th to 20th. Genealogy is one of the fastest growing hobbies worldwide, and the Irish are no exception as regards popular interest in this addictive past-time. Last year 20,000 people attended the Back to Our Past exhibition in the RDS, and this year it plays host to Genetic Genealogy Ireland 2013 - a 3-day series of lectures and presentations on how DNA can help people trace their ancestors. Ireland has a particular problem when it comes to family history research due to the vast destruction of records in the Four Courts fire of 1922. Eight hundred years of Irish history was reduced to smoke and ash in the space of a few hours. As a result, many people will hit a "Brick Wall" on most of their ancestral lines around about 1800. Only the very lucky can trace back into the 1700's. But DNA testing can help break through these Brick Walls. You can get several things from a DNA test, depending on which test you take, and which company you test with. For example, your DNA can tell you about your deep ancestry, and reveal the route your ancestors took when modern humans left Africa about 60,000 years ago. 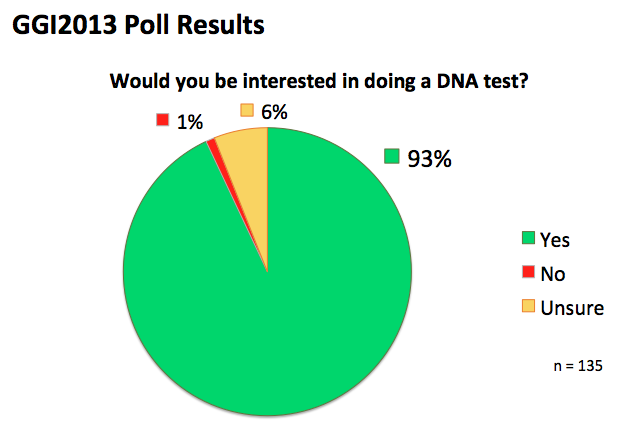 Only 14% of respondents selected this option when asked "what would you want to find out from a DNA test?". And of these 9% were interested in the deep ancestry of their direct male line (i.e. the father's father's father's line) and only 5% in the deep ancestry of their direct female line. The gender gap exists in genealogy by virtue of the patrilineal descent of surnames in Western cultures and the fact that we are a male-oriented society. Men appear in historical records more often than women. Deep ancestry makes for some interesting cocktail party banter, but it does a lot more than that - it helps to root us all in Africa, the place of our ancestral birth. We are all ultimately Africans. And this cuts across notions of race and how at the end of the day we are all genetically human, no matter what the colour of our skin. In fact, as time goes on, notions of race will become far less important than one's actual genetic makeup. It is quite possible for two people of the same "race" to have more genetic differences than two people from "separate races". There is a lot more to human beings than skin colour. Genetically, what's under the skin is much more important. Still on this topic, 17% of respondents suggested they would be most interested in discovering their ethnic makeup from a DNA test. This is a rather strange result as one would assume that most people in Ireland would be predominantly European or Caucasian by ethnicity, with very few people having African, Asian, or Native American Indian ancestral origins. Maybe there is a romantic notion that an African influence was introduced to Ireland by virtue of the Spanish Armada or trading with Spain, which after all was the first muslim country in Europe thanks to the Moors, who themselves were a mixed bag of Arab, Berber, and sub-Saharan African. Or perhaps Irish people are more interested in discovering what percentage of their DNA came from European ethnic subgroups - Viking, Norman, English, Scotch. As technology advances in this field, the biogeographical analyses that underlie these particular tests will become much more sensitive enabling more accurate assessments of ethnic admixture to be undertaken. However, the majority of people (65%) are more interested in their recent ancestry with equal numbers wishing to explore their direct male line specifically (28%) and connect with cousins on all their ancestral lines (28%). 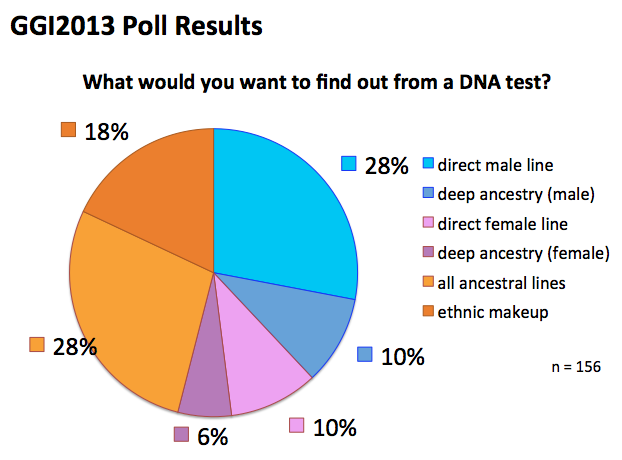 Only 9% of people were interested in exploring the recent ancestry of their direct female line. As usual, our female ancestors get a raw deal. Along the female line, the surname changes with every generation, and it is easy to lose the traces of our female ancestral heritage. This seems particularly unfair given that the majority of genealogists are women. So what test do you want to take? The last question in the survey asks "what DNA test would be the most important for you?" and again a clear gender bias is obvious with 25% choosing the Y-DNA test (which measures the father's father's father's line) and only 8% choosing the mitochondrial DNA test (which measures the mother's mother's mother's line). 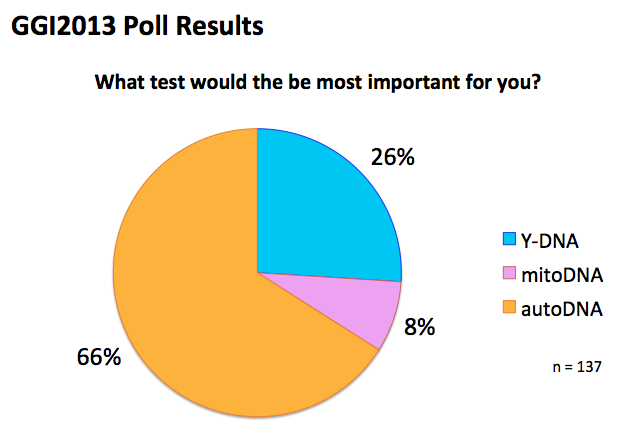 However, the vast majority of people in the survey chose the autosomal DNA test (66%). This looks at all the chromosomes and therefore assesses all one's ancestral lines. In short, not just one's direct male and female lines, but those too and everything else in between. It also provides you with a breakdown of your ethnic makeup and can reveal information about physical traits and medical risk (depending on the testing company). So it kills several birds with the one stone. And in terms of breaking down Brick Walls in your family tree, the autosomal DNA test holds out the most promise. This test will identify about 99% of first and second cousins, 90% of third cousins, 50% of fourth cousins and 10% of fifth cousins. Typically, about eight weeks after you have tested, you will get an email from the testing company instructing you to go to your own personal (private) webpage where they have uploaded your results together with a list of the people in their database who match you - your DNA cousins, so to speak. Given that the average age for the intrepid family historian is about 70 (i.e. born around 1940), and allowing 30 years per generation, most Irish genealogists will be interested in contacting DNA cousins who are estimated to be their third or fourth cousins, and who therefore share a common ancestor born about 1820 or 1790 respectively. This collaboration between genetic cousins may help break down Brick Walls in your family tree occurring around the 1800 timepoint. Many of these genetic cousins are likely to be American and some of them will have more extensive family trees than you do. After all, American records were not blown up in 1922. In fact, despite the US and Canada being relatively "young" countries historically, their genealogical records frequently go back much further than ours in Ireland. And this can provide a rich source of information when Irish records run out. Sometimes the way to go further back in Ireland is to jump across the Atlantic and trace those distant cousins who emigrated to the New World. Many of them will have recorded information about their parents that will help you push a particular ancestral line back an extra generation. What does the future hold for our past? Autosomal DNA testing is still at an early stage of development and the testing companies need to provide more tools and utilities for manipulating, analysing, and interpreting the data. There are many areas where automation is possible and this would help prevent people getting bogged down in their results. In time, as more people take this test and the tools for analysis improve, people will find this a very powerful method for identifying common ancestors. Because of the joint patrilineal inheritance of surname and Y-chromosome (it is only passed from father to son), the Y-DNA test is helping to elucidate the history of Irish surnames and it won't be long before specific surnames are linked genetically to the ancient Irish genealogies. Much of the current ongoing Irish DNA research will be presented at the forthcoming conference at Back to Our Past in the RDS. DNA testing is an additional useful tool for the genealogist's armamentarium. The results merit careful interpretation. Oftentimes DNA will not provide definitive answers, but it will frequently help focus your research and hint where to look next. As a science, genetic genealogy is relatively young (the first tests only became commercially available about ten years ago) but the fact that so many people are interested in DNA testing augurs well for the future of genetic genealogy in Ireland. Worth making clear that with autosomal DNA testing you cannot hang around, as the older the person you test, the more likely you are to get matches further back in time, because of the 4-fold drop in test sensitivity per generation. So there really is no time like the present. Of course any Y-DNA like can terminate or daughter out in the next generation if the sons do not marry or only have daughters. And the mtDNA signature changes with every generation anyway unless you are tracing. But given the loss of so many Irish records in the 1922 fire, autosomal DNA testing will reap its greatest benefits with the older generation right here and right now. I took my mother's DNA test for Ancestry, four months before she passed away in 2015. It gave us so many results, much more than our own tests. She was 100 years old. Don't let their age discourage you. Give it a try before they're gone.